The area reacted to a mix of wintry weather that resulted in icy conditions and rain on Tuesday. Snow and ice make driving in Pittsfield, Monday Feb. 15, 2016. Kids play in the water slides and the activity pool to keep cool at Bousquet Mountain in Pittsfield on the hottest day of the year so far. Snow falls again in Pittsfield on Thursday, February 5, 2015. 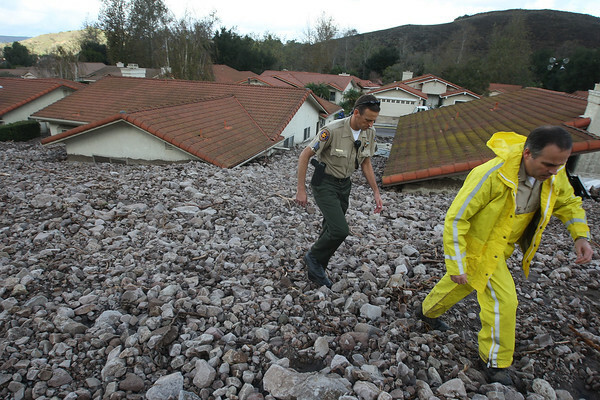 Up to 5 inches of desperately needed rain fell in some areas of Southern California, where several areas were hit by landslides, some areas saw minor flooding and fire officials rescued two people and pulled two bodies from rivers.